This cute little no-sew scarecrow costs next to nothing to make – just like a real one. 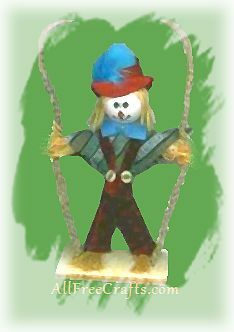 This doll stands only 7″ high, however, and is made from a miniature 6″ corn broom. Following the picture above, use markers to draw the facial features on the Styrofoam ball. You can also create pink cheeks, if desired, by rubbing a tiny bit of lipstick on the cheek area. Next, take the corn broom and divide the bottom into two legs, each tied off at the ankle with a small length of raffia. Now create the arms from a 6″ bunch of raffia, tied off at the wrists. Insert the broom handle in the center point of this raffia bundle, extending past the raffia by about 1/4″. Hot glue in place on the broom handle. The pants are made by tracing around the doll legs and creating a pattern, adding about 1/4″ around and cutting out two pieces, one front and one back, with the pant length coming to the ankle and allowing the corn feet to show beneath. You can draw the pattern directly on the back of your fabric with pen or marker.